Emanuel Lasker and Alexander Alekhine met eight times in their career. Seven of the games were from tournament games. Their first game was considered an exhibition game. In 1908, Alexander Alekhine, age 15, traveled to Dusseldorf and Munich to observe world champion Emanuel Lasker defend his title against Siegbert Tarrasch. Lasker and Alekhine first met in an exhibition game in Moscow on March 28, 1914. The game was drawn in 16 moves as it led to perpetual check Alekhine had White and played a Scotch Game. Lasker proposed the draw and Alekhine accepted. In 1914 Lasker was 45 (born in 1868) and world champion (1894-1921). Alekhine was 21 (born in 1892) and was world champion from 1927 to 1935 and from 1937 to 1946. Lasker played Alekhine before he played Capablanca. The two then met in the great St. Petersberg International tournament in April-May, 1914. Their first encounter in the preliminary section of the tournament on April 30, 1914, was a draw in 25 moves. Lasker had White and Alekhine played a Center Counter Defense. Capablanca won the preliminary section with a score of 8 out of 10. Lasker and Tarrasch had a score of 6.5 out of 10. Alekhine and Marshall had a score of 6 out of 10. These five players would play in the Finals. Their next game was played in the finals or Winner’s Group on May 10, 1914. Lasker had White and won in 35 moves. Alekhine, as Black, played 1.d4 d5 2.c4 e5, the Albin Countergambit, and lost. A week later, on May 17, 1914, Lasker won again with the Black pieces in a Ruy Lopez, Exchange variation that lasted 89 moves. Lasker had two rooks and a pawn against Alekhine’s rook, knight, and pawn. Lasker won the tournament, followed by Capablanca. Alekhine took 3rd place, Tarrasch took 4th place, and Marshall took 5th place. In July 1914, Alekhine played in the main tournament in Mannheim, the 19th German Chess Federation Congress. Lasker was a guest of honor at the event and was there to make plans for an International Chess Federation. Lasker left the event before World War I broke out on August 1, 1914. The two did not play each other for another 10 years. 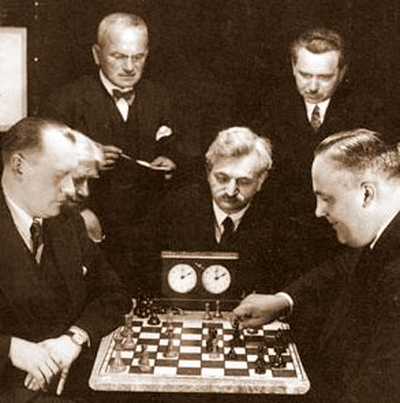 World War I interrupted most major chess tournaments and Lasker played little until 1923. Then in March-April, 1924, they both played in the New York 1924 International tournament. On March 18, 1924, Lasker (age 55) won again with the Black pieces in 36 moves in a Queen’s Gambit Declined. Alekhine was 31 years old. Their next game in the same tournament occurred on April 10, 1924, and the game was drawn in 30 moves. Lasker had the White pieces and played a Queen’s Pawn opening. The event was won by Lasker (16 out of 20), followed by Capablanca (14.5) and Alekhine (12). Alekhine would become world champion three years later. Up to 1925, Lasker was the stronger player. Alekhine was in his prime from 1926 to 1936. In 1925, the tournament organizers in Moscow invited Lasker, but not Alekhine. The two waited another 10 years before they played again. Lasker was now 65 and Alekhine was 41. On July 25, 1934, Alekhine had the White pieces and finally won in brilliant style in Zurich, Switzerland (37th Swiss Championship). The game lasted 26 moves with a queen sacrifice offer. Alekhine was current world champion (1927-1935 and 1937-1946). The opening was a Queen’s Gambit Declined, Orthodox Defense, Alekhine Variation. In 1935, Lasker went to Holland to cover the world chess championship match between Alekhine and Euwe for the Russian newspapers. The organizers of the 1935 and 1936 Moscow tournaments invited Lasker, but not Alekhine. Their final encounter occurred on August 13, 1936 in Nottingham, England. Lasker had White and the game was drawn in 18 moves. Alekhine played the Nimzo-Indian Defense. At the time, both players were former world chess champions. The event was won by Capablanca and Botvinnik, who tied. Alekhine was 6th and Lasker tied for 7th.